For other praetors with this name, see Servius Sulpicius Galba (disambiguation). Servius Sulpicius Galba, praetor in 54 BC. As legate of Julius Caesar's 12th Legion during his Gallic Wars, he defeated the Nantuates in 57 BC in the Battle of Octodurus. 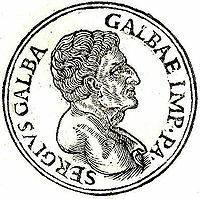 Servius Galba then had a dispute with Caesar over a debt, also felt his friendship with Caesar cost him the consular election in 49 BC. In 45 BC, Galba complained that the Senators were not given their proper respect. According to Suetonius, Caesar had an affair with Galba’s wife, which caused more anger. Later, angered by Caesar's opposition to his campaign for the consulship, Servius Galba joined the conspiracy with Brutus and Cassius, and was consequently condemned to death by the Pedian law. He was the great grandfather of the Roman Emperor of the same name. ^ Julius Caesar, Commentarii de Bello Gallico 3.5 Retrieved 2009-10-02. ^ Gaius Suetonius Tranquillus (2008-12-13). "The Life of Galba, 3.2". The Lives of the Twelve Caesars. Retrieved 2009-10-02.